Named Morgan Taylor after the daughters of the company’s founder Danny Haile and executive vice president David Daniel, the line offers a fresh color palette that boasts unique finishes including lots of glitters and metallics in its initial launch. NAILS caught up with creative director Alesia Lanzo, the visionary behind the color choices, to ask about Morgan Taylor’s color inspiration. Q: How did you come up with the color palette? A: My specialty is to create unique finishes, whether it’s different types of glitters or different types of micas. My background is in trends and color forecasting, so I wanted to do an innovative palette and something that offered colors you can’t get everywhere else. Some of my inspiration with the blues, greens, and neutrals was to create new colors for those particular color families. The nail market even a few years ago consisted of very traditional colors and a much more conservative palette. I wanted to push those limits and make the core palette a lot more exciting. Q: Was it hard to narrow it down to the initial launch colors? A: It was. I made about 250 colors before I narrowed it down to the 100 I wanted to launch with. A lot of people ask me, “How do you know what people are going to want?” It’s something I’ve harnessed throughout my career working in the nail category. It’s a gut feeling that you’re born with that you harness. When I’m in the labs and I try on the color (and I’m a big proponent of wearing everything I make), I feel it. You see it and you can imagine how people will feel when they wear it. For more information, go to www.morgantaylorlacquer.com. 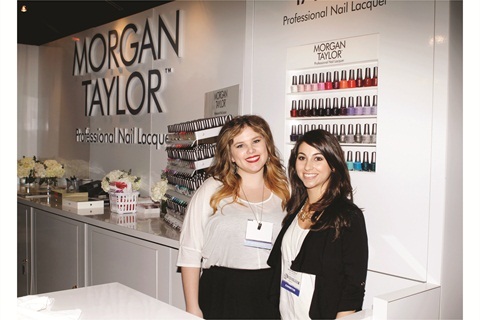 Watch a video of the Morgan Taylor Nail Lacquer soft launch at ISSE 2013.